Brass Spigot And Drain Upgrade Kit is rated 4.3 out of 5 by 50. Rated 5 out of 5 by DougF from Excellent experience. Came when expected. Easy to install. Works perfectly.... Excellent experience. Came when expected. Easy to install. Works perfectly. Rated 5 out of 5 by HappyGardener from I am so glad they have this available. I replaced the original plastic spigot with a copper one (... I am so glad they have this available. I replaced the original plastic spigot with a copper one (bought at the store in plumbing dept.) that is short. Using a hose and or watering can, it move the spigot back and forth which wore out the seals. While purchasing the replacement seals online from Home Depot, I also noticed this longer spigot from Earth Minded and so glad I purchased it. Now I can easily fill my watering can. I love my Earth Minded rain barrel! Rated 1 out of 5 by Mike from The barrel I bought had a plastic spigot already fastened... The barrel I bought had a plastic spigot already fastened in place, and trying to remove it to replace it with the brass spigot would have ruined the barrel. Can't understand why you recommended it in the first place. Rated 5 out of 5 by Jimbo from This upgraded brass spigot and drain kit is a great addition to any rain barrel. The brass pieces... 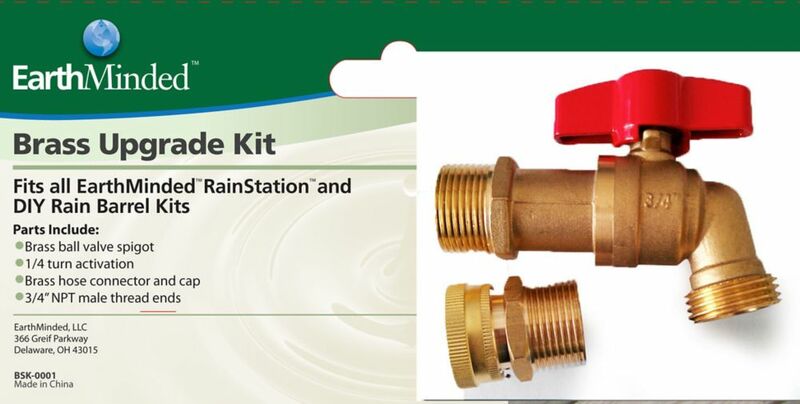 This upgraded brass spigot and drain kit is a great addition to any rain barrel. The brass pieces will hold up much better over time versus the plastic pieces that come standard with most rain barrels, especially if your rain barrel is installed where UV rays from the sun can degrade plastic over time. I bought this upgrade kit from Home Depot at the end of the summer (2017) to go with an Earth Minded Rain Barrel so that I would have a heavier duty spigot that would last. The quarter turn valve of the spigot is easy to turn on and off, and uses a stainless steel ball inside it to turn the flow of the water on and off. This makes the spigot work extremely smooth, fast and efficient. A garden hose, or other garden hose threaded items attach to the exterior threads of the spigot easily and securely. As a few other reviewers have noted, the brass drain and cap, while heavy duty and well built from solid brass, may not come with the proper 3/4 inch garden hose thread on them. It appears that the exterior male threads of the drain, and the internal female threads of the cap are a non-tapered male pipe thread, and any items with a standard garden hose thread will not fit onto the drain. I was going to buy an adapter as another review said they did, but before I went this route I contacted the Earth Minded company at the email address one of their representatives supplied in the question I posted asking about this issue. I contacted the company with my issue, and the president of Earth Minded wrote back to me! Through some research, he found out that a batch of the drains and caps had threads that were out of spec for garden hose items, and no 3/4 inch garden hose threaded items would fit on the drain. Because of this, the brass cap will only fit on the brass drain, and it will not fit onto any items with a 3/4 inch garden hose thread. While the brass drain and cap can be used together, it pretty much defeats the purpose of being able to attach a garden hose to the drain if you wanted to do that. However, after I contacted Earth Minded about this, and it was found out the threads on the drains an caps were out of spec, I was offered the option of replacing the brass drain and cap with another brass spigot! How is that for customer service! The replacement brass spigot was shipped out to me very quickly, and included new rubber grommets to install it into the rain barrel incase the original rubber grommet was damaged while taking out the brass drain. I emptied out my rain barrel, removed the brass drain and installed the new brass spigot in the bottom hole of my rain barrel. I can now use the spigot as the drain! And best of all, I can attach any standard garden hose item onto it just like the other spigot. The president of Earth Minded suggested that to use the spigot as a drain that I could install the spigot at a 90 degree angle so it would not stick down and contact the ground. But I had made a 15 inch tall wooden base for the rain barrel to sit on, so I was able to install the spigot in the standard downward position. So I can use it as a drain or as an attachment for a garden hose. If anyone who orders this upgraded brass drain and cap from Earth Minded finds that they received one of the drains and caps that have the out of spec threads on them, and your garden hose won't attach to the drain, please contact Earth Minded and let them know, and give them a chance to fix the issue before you post a bad review. I did, and I am glad for taking the time to contact them and letting them know about it. I can not say enough about the great customer service I received, and the fact that they took the time to listen to my issue and fix the problem for me. Rated 5 out of 5 by Fauster from The product itself is very good quality. But it is important to note that it will only work on a... The product itself is very good quality. But it is important to note that it will only work on a rain barrel that is tapped for a 3/4" NPT (National Pipe Thread) spigot. If your rain barrel has a male protrusion with 3/4" GHT (garden hose thread) like mine, you will need to find a female-to-female adapter with 3/4" NPT on one side and 3/4" GHT on the other. Home Depot listed this item in the 'Frequently Bought Together' section of my rain barrel description but did not mention that an adapter was required. Rated 3 out of 5 by HomeDepotCustomer from It is possible to get a better spigot at the hardware store. It is possible to get a better spigot at the hardware store. Rated 5 out of 5 by rchammy from Excellent product. Excellent product. Rated 4 out of 5 by Jack1 from Was easy to install nd works well. ... Was easy to install nd works well.